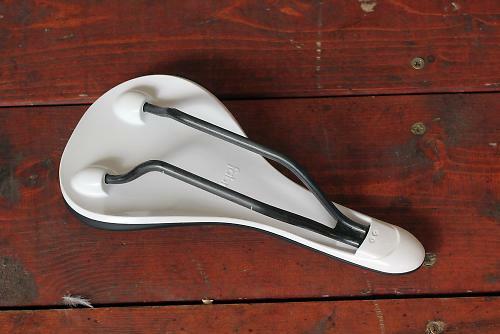 If the Fabric Scoop saddle looks familiar, that's because it's essentially the same as the Charge Bikes Scoop saddle. Charge have launched Fabric as a new standalone brand with a complete new range of saddles, and the Scoop is the first release under the new name. While the general shape of the saddle is similar, the Charge folks have developed a wider range of saddle shapes to better accommodate different riders. The Scoop is now available in three shapes: flat, shallow and radius. All three Scoop variants are the same width: 142mm. If you want a wider saddle, Fabric offer the 155mm Cell, while the 134mm ALM is your choice if you want something narrower. That's a lot of choice, and to help you choose the correct saddle, Fabric have a fit guide on their website. I went through the various steps and came out with a flat preference, which is generally considered the best choice for anyone adopting a deeply tucked position. No surprise then that is's a very flat saddle, but there is a fair amount of curvature across the rear of the base and a flat nose, with minimal padding. It's the sort of shape that suits me very well, and I immediately found it comfortable pedalling down the road. The rear of the saddle kicks up a bit and that helps you keep you in the optimum position, and the central channel recess provides some pressure relief. I've knocked out everything from one-hour blasts around the lanes to 200+km rides on this saddle, no problem. Though there isn't much padding, there is loads of flex in the one-piece base and it's this flex that really provides the core of the comfort. The carbon rails do provide a surprising amount of flex, but their shape and size isn't compatible with a lot of seat post clamps, so the best advice is to check your seat post is compatible; you might need to change clamp or post. That provides the saddle with a sleek look and it is a fine complement for any high-end road bike. It's light too, especially if you plump for this carbon rail and reinforced fibre-nylon base version which tips the scales at 190g. That's very impressive and compares well with other saddles at this price. For those without such deep pockets, the Scoop range starts at just £40 and rises to £160 for the carbon base and rail model. The Scoop is a middle-width saddle designed to provide flexibility and comfort in all disciplines of modern cycling. It is the perfect balance of comfort, performance and simplicity. The Scoop is available in three saddle profiles, a large selection of colours and a range of build specifications. All of Fabric's Scoop saddles share the same simple three-part manufacturing process; they comprise a cover, base and rail. This minimal manufacturing technique removes any staples and excess material which is synonymous with traditional saddle design – this further reduces weight, improves comfort and is much easier to clean. Our exclusive new construction technique allows for a more comfortable foam topper and improved flexibility in the base. Every Scoop is encased with a durable and waterproof microfibre cover which is grippy whilst still allowing you to move freely around the saddle. And seeing as perhaps the major advantage of a leather or plastic cover is durability, how does the saddle stand up to regular abuse? I've had the saddle in it's old Charge guise on two bikes, for 2 years and six months. They are weathering very well. One shrugged off sliding down the road at 25 mph following an off.